I have been using my Rocky Mountain Altitude 730 for over a year, from cemented roads to muddy, dirty and rocky mountain trails. My Shimano XT groupset worked flawlessly until I noticed hard shifting. At first I suspected that my rear derailleur hanger was already bent. It wasn’t. Then I shifted my focus on the shifters themselves. They were fine. I checked the whole drivetrain. No problem at all. Finally I removed the shift cables and housing and whalla!!! They were dirty and the cable coating has worn out. The cable housing also had dents that can’t be corrected. 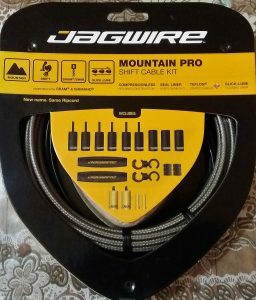 It was time to buy a replacement kit and Jagwire was on top of my list. The Mountain Pro Shifter Cable Kit comes with all the necessary items needed to replace your worn out shifter cable and housing. The materials used are top notch. The cables are coated with a silky film and when paired with the mountain pro cable housing, the cable travel is friction less. Installation was a breeze provided that you have the correct cable cutter. You also need to understand how your cables are routed so that you won’t have any trouble during the installation. It’s been 6 months since I installed the Mountain Pro Shifter Cable Kit on my bike and what a difference it has made with my riding. Shifting gears has been buttery smooth and I see no degradation even in dirty and muddy conditions. I highly recommend this product to anyone who are upgrading their cables and housing.